It's Giveaway time and you are not going to believe this! Over 20 items up for grabs from AMAZING bloggers all over the USA! It's Top Teacher's Giveaway Galore! Contest runs from Tuesday, April 24th through Friday, April 27th at Midnight EDT. Winner will be announced on Saturday, April 28th! Fill out the Rafflecopter form below for a chance to win this from me!! Then stop by these great BLOGS, look for this same post and enter to win their free products with them! Alphabet Writing: Quick Prompts From A to Z by Erin of Small Types: "Get students' pencils moving and their creativity flowing with these short alphabet-themed writing prompts. Students can write notes to friends, make lists, turn alphabet letters into main characters and describe the details in fictional adventures--All corresponding to the letters of the alphabet. (Includes five prompts for each letter to suit different levels and interests.)" The Three Frogs by Arlene of LMN Tree: "This is an ELA Guided Reading and Writing Unit for Grades 1-2. It includes a complete lesson plan, Word Study, Make and Take Book, Graphic Organizers, Story Sequence Writing Activity, Phonics Worksheet, Writing, Chant and Activities. Digital Clock Sorting Game by Jennifer of Best Practices 4 Teaching: "This product allows students to sort digital clocks by 'quarter til', 'quarter of', 'quarter after', etc. Students will quickly see the pattern of the times and commit it to memory! In 2 days, all of my students had learned this concept using this sort whereas the lesson in our math kit totally confused them!" Awesome! Thanks for joining in! I am currently teaching 2nd. Still not sure about next year maybe moving to 4th. These would definitely work for 4th. 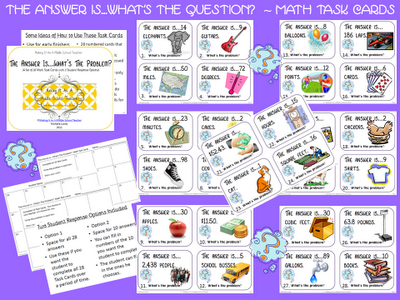 Many of the cards could also work well for 2nd graders making simpler problems. Thanks for joining up with me! That is oh so true, Christin! We have to be flexible, don't we? Wow, Heather! That sounds like quite a busy job! I teach 6th grade! Middle School teachers unite! Woot! LOL, Katie...I totally agree. We are a unique breed, aren't we? This would be great for my high student/early finishers! Absolutely, Lindsay! This will cover quite a range of grades since it's open-ended. I am torching middle school next year and would love this. Starting to teach 6th grade this fall! Wonderful! Best of luck to you! Thanks for stopping by, Mindy! I appreciate you coming by and entering the contest! Your teaching tips very helpful thanks for share it personal statement for teaching .